The Nashville Public Library hosts their summer reading program from May 25 to August 12. Readers are expected to read 10 hours, and upon completion will be rewarded a ticket to an area attraction of their choosing. Linebaugh Summer Reading program runs from May 22 to July 21. Readers are able to collect weekly prizes for completing their reading goals. There are also several activities hosted each week at the library. Williamson County Library summer reading program begins May 19. Each branch has a variety of activities for the patrons. We've enjoyed attending puppet shows at the Nashville Main Branch Library. This summer we are looking forward to attending several more shows. The puppet shows are on Friday and Saturday at 10:30 and 11:30 am. Viewings are first come, first serve. Nashville Puppet Festival which is held every three years. It's not scheduled for 2017. String City at Country Music Hall of Fame shares the history of puppetry and music in Nashville. There are several show dates: June 26-July 8, 2017 (except Sunday, July 2) at Country Music Hall of Fame and Museum. The shows take place at 10:00 and 11:30. Hike some trails. There are numerous trails throughout Middle Tennessee such as the Greenway System in Murfreesboro, the Nashville Greenways, and the Franklin Greenways and Trails. Enjoy the water at Nashville Shores, Wave Country, Cumberland Park, and SportsCom. Go Geocaching! We love geocaching. It’s something special about going on a scavenger hunt together. Kids Art Festival of Tennessee will be held June 3 from 10 to 3 at Pinkerton Park in Franklin. Moon Pie and RC Cola Festival will be held June 17 in Bell Buckle. This is an annual festival. The girls and Vic have attended, and they experienced fried moon pie. Uncle Dave Macon Days Music and Art Festival is held annually in Murfreesboro. The event will take place July 7 and 8. There are plenty of opportunities to enjoy a free or discounted movie with the kids this summer. Movies in the Park in Franklin will be held on the following Friday evenings, June 24, July 8, and July 29 at Pinkerton Park at 8:00 pm. Movies under the Stars in Murfreesboro will be held for 8 weeks beginning the week of June 5 with showings at several local parks. The movies begin at 8:30 pm. Nashville Scene Movies in the Park in its 23rd run will be held at Elmington Park on Thursdays in June. There will be food trucks and games to kick off each movie at 5 pm. The movie will begin around 8 pm. Regal Cinemas Summer Movie Express, $1 Movies on Tuesdays and Wednesdays until August 2. Kids Skate Free offers free admission to SkateCenter West in Murfreesboro. Kids Bowl Free offers two free games of bowling every day during the summer at participating bowling alleys. Fourth of July Rock the Pool, SportsCom in Murfreesboro from 10:00 am to 4:30 pm. Music City July 4: Let Freedom Sing- Free concerts at the Ascend Amphitheater and The Green at the Riverfront Park. There will be tons of activities for the family including a kid zone. Franklin on the Fourth in downtown Franklin includes a festival with vendors, a children’s parade scheduled at 5:00 pm, and live music. There's plenty of things to do in Middle Tennessee this summer. 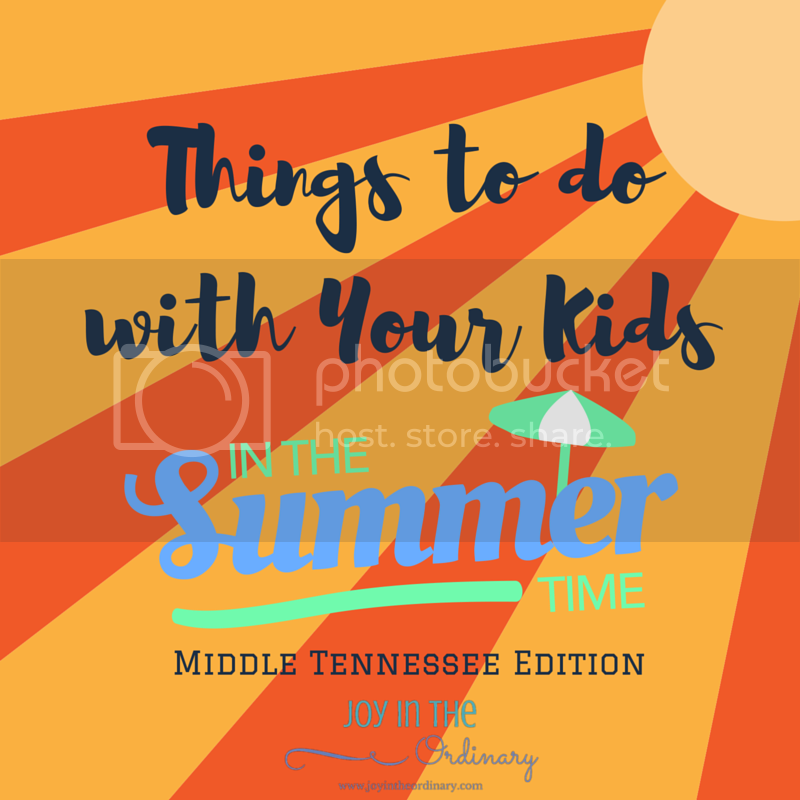 I hope this list will help you create a summer your children will not forget. I will continue adding to the list as I learn about more things to do in the area.